It's the coveted week or two of the year, your chance to jet off for a romantic getaway and enjoy some quality time together. Forget about that pile of paperwork, ignore incoming emails and set your out-of-office – it's time to escape in style on one of our luxury couples holidays. Experience a world of extravagance and exceptional comfort in decedent destinations and magical locations. 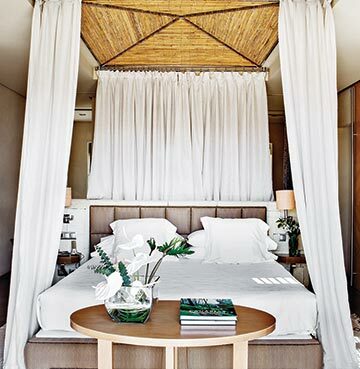 From beautiful bustling beachsides to serene sanctuaries secluded in rolling hills. This is holiday-high living – and it never felt so good! The anticipation of getting away with a loved one and experiencing something new together is always the high point of the year. So it's only natural that you want everything to be perfect. Whether you're craving candlelit dinners on your private balcony, strolls on sun-kissed sands or unparalleled panoramic views – enjoy the pleasure of each other's company in unrivalled settings. Luxury comes in many forms, and it means something different to everyone. From little touches to grand gestures and all the in-between details, our villas are a blissful backdrop to a heavenly holiday. Indoor elegance is matched by outdoor sophistication, with a blend of lavish furnishings, state-of-the-art kitchens, quality linen, en-suite bathrooms, stylish sunloungers, landscaped gardens and incredible infinity pools to boot. Wildly romantic and the very definition of decadence – Italy is the ultimate luxury couples holiday destination. Packed with more UNESCO World Heritage Cultural Sites than any other country on Earth, it's a place of year round delights. Between rural retreats in the rolling countryside and seascapes on the magnificent Mediterranean coastline, here you'll find one of nature's finest work. A masterpiece of spectacular landscapes and mouthwatering local cuisine. Always alluring, beautiful and charming it's a treasure for a twosome looking for luxury. Chicest of the chic, covered in candy coloured towns and cliff-hugging coastal roads – The Amalfi Coast is bountiful with beautiful bucketlist treasures. Often referred to as 'one long sunny, south-facing balcony', it's not hard to see why. Blessed with blissful views overlooking the glittering Tyrrhenian Sea, mountains plunge into the water with dramatic brilliance. Nothing beats a good old fashioned road trip along the scenic stretch. Be sure to leave yourselves plenty of time to navigate the windy roads, take pictures and savour the views. Being one of the most luxurious coastal destinations in the world, a sun-soaked day at the beach is most definitely a must. Whether you're after the iconic stretches covered in colour-coded umbrellas or something a little more secluded, the Amalfi Coast doesn't disappoint. Made up of (mostly) pebbles and dark sand, paradisiacal bays lie at the bottom of watchful craggy cliffs. 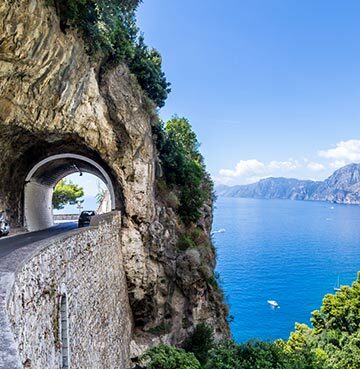 Once you've explored the coast from mountain top nature trails and sun-baked beaches, head out on the crystalline waters for a chance to see famous Capri. 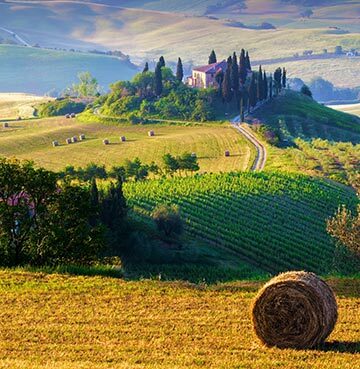 If you're more interested in rural retreats and getting back to nature, then the timeless elegance of Tuscany will take some beating. For lovers of the great outdoors, there are few holiday destinations as perfect for outdoor activities. A dreamy landscape of rolling hills, verdant vineyards and lovely lakes. It's no wonder so many artists have found inspiration in the Tuscan countryside. With every view more postcard worthy than the next, explore, hike and bike your way through hilltop villages and plunging valleys. Natural thermal springs are nestled in lush surroundings, rich with minerals from the earth, they're the perfect form of relaxation. Many of the springs now offer facilities including massages and mud baths. There's plenty for culture vultures to sink their teeth into too, with world-class art, historical relics and amazing architecture. A true gourmet destination, it's one of the world's worst kept secrets that Italians love their food. You'll find there's so much choice it's almost impossible to work your way through the menus during the course of your stay! A tactical order or three might just help the two of you sample more of the sumptuous dishes (what's mine is yours, and all that). If you're not 'sharers' make a bee-line for Torta di Ceci (thin savoury cake) or for the brave, a Lampredotto panini. Made with the fourth and fifth stomach of a cow, it's a typical Florentine dish. Pizzerias, eateries and restaurants serve only traditional food, so wherever you go you know you'll be tasting the true flavour of Italy. If a luxury couples holiday in Italy sounds like your idea of heaven, here's some inspiration for even more incredible things to see and do. Get lost with someone you love on a luxurious island paradise. Sun-drenched, easy-going and bursting at the seams with natural beauty, the Caribbean is a perfect destination for couples. Prepare to be dazzled by deliciously diverse landscapes and infectious charm. From underwater worlds to the sounds and smells of tropical rainforests – not to mention some of the best beaches in the world – you'll be hard pushed to find a more relaxed retreat. The stunning shores of St. Lucia are lapped by sapphire blue waters and dripping with luxury. 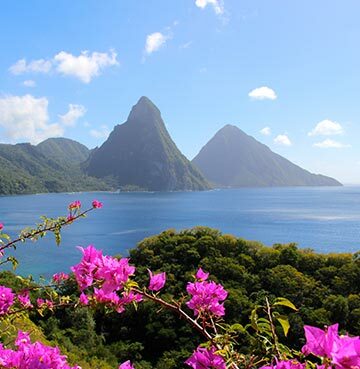 Breathtaking views appear around every cove, with the pinnacle point featuring the impossibly picturesque Pitons. A view you'll never tire of, this luscious UNESCO World Heritage Site is the crowning glory of the spectacular south-west corner of the island. Extending down under the sea as far as they tower above, a snorkel or dive reveals coral reefs teeming with marine life and exploding with colour. Above the waves, trekking to the top of Gros Piton is one of the most popular tours of the island – although not an easy climb, the 360° panoramic views more than make up for it! St. Lucia is hard to match for the elusive combination of adventure and romance. Plenty of action can be found across the island, from zipling through jungles to exploring the world's only drive in volcano. More relaxed ventures include sunset catamaran cruises and gentle walks among the beautiful botanical gardens. Once you've had your fill of explorations, the tropical treasure doles out intimate moments of tranquillity and serenity. Walks along golden sands at sunset, birdsong sweetly serenading you in the morning and seductive smells of sweet flowers soothing the senses. A swoon worthy destination like no other – St. Lucia somehow manages to be down-to-earth and luxuriously lavish all at once. 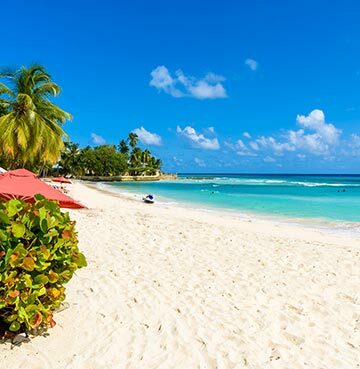 Feel like you're the only two people in the world as you walk hand in hand, strolling barefoot on the Platinum Coast in beautiful Barbados. Shaded in palms and fringed by beautiful beaches, this is the place to live out the lifestyles of the rich and famous. Every bit as lavish, extravagant and luxurious as you'd imagine, the little coral island is the perfect place to put your feet up. Stunning sunsets, wild waves, brilliant turquoise bays and an irresistible island interior mean there's not a bad view in the house. Abounding in history, nightlife, the arts, fine dining and out-of-this-world spa and leisure facilities – it's always playtime in Barbados! Luxury holidays are all about indulgence, and the delicious dishes offered up in droves on this tropical treasure don't disappoint. Bajan cuisine is a unique blend of African, Indian and British influences. Tantalise your taste buds with freshly caught fish, locally farmed meats, sweet plantains, not to mention curries and rotis galore! Be sure to head to the coastal village of Oistins on (any) Friday after sunset and join local fishermen as they indulge in frying and grilling freshly snared swordfish and mahi-mahi. To make the whole thing even more easy-going, there's reggae and calypso tunes blasting through the night. There's a lot more where that came from, the likes of Antigua, The Dominican Republic and Jamaica are all wanderlust worthy locations perfect for couples too! A match made in holiday heaven, Greece and luxury couples holidays go together like sand and sea. Soaked in sunshine, bountiful with beaches and buzzing with cultural hotspots, you'll find quality time you can treasure – mixing leisure and pleasure to perfection. Savour delicious dishes and the unhurried pace of life, explore breathtaking landscapes, venture through unspoilt fishing villages and mingle with larger than life locals. Breathe deep as days melt seamlessly from one to the next. Relax under sizzling skies, set sail on glittering blue seas, watch in awe as the sun sets, and come home to your luxury villa – perfectly positioned to make the most of these special moments. Seductive Santorini is inevitably the star of the Greek Island show and one of the most notorious couples destinations in the world. 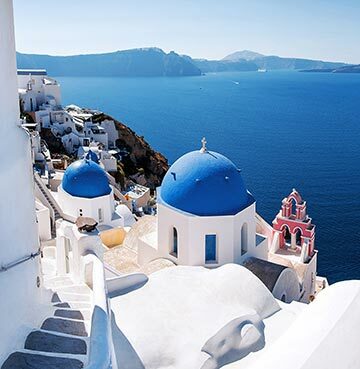 Whitewash villages overlook the azure waters of the Aegean Sea, with iconic blue domed churches scattered along the landscape. Boasting bucketlist views around every corner, the unrivalled seascapes from Oia are out-of-this-world. Watch as fiery sunsets sink into the horizon of the midnight blue waters in the caldera. The very definition of luxury, a Santorini holiday is a once-in-a-lifetime experience. Get to grips with the crescent shaped island and explore its traditional villages and picturesque black sand beaches. Hike the caldera between Fira and Oia, or take a boat trip to natural hot springs and sail across the caldera itself. Visit a volcanic crater and discover Ancient Akrotiri (an impressive archaeological site), as well as the beautiful village of Pyrgos which commands the highest view point in all of Santorini. For action and adventure couples, you can rent ATVs, quad bikes and scooters from various operators all over the island – an exhilarating way to see the sights. Helicopter tours are also available, well this is a luxury couples holiday after all! The biggest of all the Greek Islands, it goes without saying that Crete caters to every kind of couple. From sun-drenched sand stretches in the north, to rugged canyons, coves and cliff-lined coastlines in the south. Rest assured you're well catered for whether you're a dedicated beach bum or venturesome double act. Trek through Europe's longest gorge and walk, climb, drive and cycle your way across magnificent mountains and dramatic landscapes. Stunning seascapes reveal the gorgeous glittering Mediterranean in all its glory – a fantastical feast for the eyes. Speaking of feast, Crete is a foodie heaven for couples who enjoy wining and dining each other. Tuck into the freshest of fish and incredible home grown local produce. With one of the oldest gastronomical traditions in the world, you're in good hands when it comes to mealtimes. Tantalise your taste buds with traditional dishes like Dakos (a Cretan Bruschetta), Loukoumades (honey soaked donuts) and Souvlaki (skewer of meat – usually chicken or pork). Picture-perfect Blue Flag beaches fringe the island in a virtually uninterrupted stretch of sand. Awash with party hot-spots and historical must-sees – like all the best destinations, Rhodes has a bit of everything. A luscious landscape plays host to year round activities and perfect terrain for mountain biking and hiking. Countless nature trails are just waiting to be discovered, and will lead lucky couples through wooded valleys and coastal cliffs. For those who are less about their pedometer count and more interested in a romantic road trip, take a drive along Rhodes' west coast and marvel at the rugged beauty of a captivating coastline untouched by man. 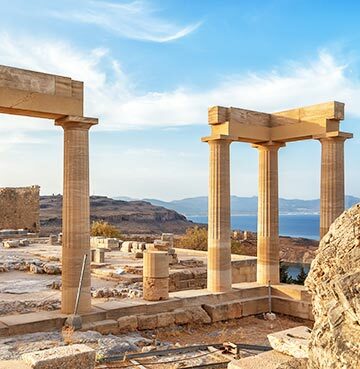 Visit the beautiful village of Lindos for picture-perfect holiday snaps of iconic white houses and amazing archaeological sites. 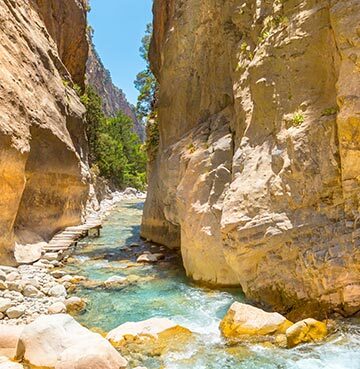 Bewitching and beautiful, Greece has so many gorgeous getaways to choose from. Take a look at the most romantic Greek islands for even more inspiration.